Since the late 1960s, when micro-processors first became a part of the automotive landscape, we have witnessed an exponential rise in computation capabilities that is clearly vectoring onwards and upwards, pushed by a relentless drive to increase electronic content in the cars that we drive. For example, manufacturers such as Mercedes and Audi imagine their next generation luxury car offerings to be nothing short of “digital living spaces” wherein drivers / passengers are carried along motorways in comfortable cocoons while immersed in virtual worlds of touch-screen panels and computer-rendered surroundings. Perhaps future car buyers will think less about horsepower in the traditional sense, and more about “computational horsepower.” But what level of computer horsepower might actually be required to deliver the experiences envisaged by auto manufacturers? Short answer: A lot. NVIDIA’s Danny Shapiro has disclosed that the processor used to power the company’s Drive CX “cockpit computer,” is capable of one trillion floating-point operations per second (flops). To put this into context, this was house-sized super-computer territory a mere 15 years ago. Today, a single car can have hundreds of processors like this in play. 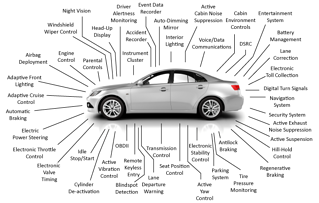 If you are a technical manager in an automotive company, an obvious question leaps to mind: Given the staggering number of on-board systems (and system suppliers! ), and the time-to-market demands of new model releases, how is it possible to sign off on a car aimed at marketplace excellence with any measure of confidence? The key to this puzzle is to recognize that no matter how much “technology” is poured upon automobiles, the challenge remains the exactly the same: How might a potential buyer engage joyfully with your vehicle? Perhaps the definition of a pleasurable visceral experience is indeed shifting from away from the smell of burning petrol and the thump-thump sound of a capable engine towards participatory joys in the IoT. But, nonetheless, people remain at the center of the final experience, and should remain in the middle of the vehicle development process. As a case in point, consider Mazda’s recently announced SkyActiv-Vehicle Dynamics, a suite of motion control technologies such as G-Vectoring Control (GVC), that is scheduled to roll out across their entire product range over the next few years. GVC is a subtle, computer-controlled throttle-feathering strategy that is cued by a driver’s steering wheel inputs. Mazda developed this via an extensive study of how human drivers react while they are controlling cars, and how these vehicle control interactions relate to vehicle lateral and longitudinal accelerations. It is, of course, built on top of a confidence layer that assumes computational authority (the sensing, processing, and computer control of the engine must be fast.) But it is the quality of the human / system interaction that will be the key to its success or failure in the marketplace. So what might be the sign-off process for a system such as this? It is no secret that simulation technologies are heavily relied upon when engineers are faced with decidedly “complex” vehicle developments. Simulation technologies sometimes exist in silos, associated with specific functional requirements, e.g. vehicle manufacturers may have drivetrain-specific simulations that have very little overlap upon, say, steering system development focus areas. In other cases, simulations are meant to serve cross-functional requirements. Either way, the same computer technologies that are making their way into the end products (the vehicles themselves), are now being harnessed to develop those very products (vehicles). Computers are developing computers. If a vehicle, as a consumer product, is meant to satisfy the desires of consumers (real people), then it stands to reason that real people should be involved as extensively and intricately as possible in the vehicle development process. This has, of course, always been the case. Real people (test / evaluation drivers) have traditionally had plenty of seat time in their cars before releasing them into the wild. Unfortunately, the inclusion of on-board system places inescapable constraints upon the development process, so there is no longer, practically speaking, time enough to explore all the possibilities. How can this be addressed? When real drivers / evaluators are able to close the loop on simulations, many constraints are lifted. Product development work that normally requires a proving ground can occur in a controlled laboratory in advance of (or concurrently with) the evaluation of real prototype vehicles and systems. Driver-in-the-Loop (DIL) simulators are one way to accomplish this. DIL simulation is but one aspect of the changing automotive landscape. To learn more about how this technology is influencing the vehicle development process, download our FREE white paper, “Look Down the Road: Driving Simulator Technology & How Automotive Manufacturers will Benefit”.